Cecelia Lizotte, owner of Suya Joint on Dudley Street, said her restaurant would benefit from a safer environment. The Dudley Square of Roxbury’s dreams is a vibrant commercial district and destination where people of color who have lived there for generations run businesses, raise families, and spend money like they did years earlier when the area was a major shopping hub. If only the path to realizing the dream were as clear as the vision the neighborhood has for its future. On Saturday, residents, activists, and business owners huddled to chart a path for Dudley Square, where vacant storefronts and the closing or planned closing of six businesses have some sounding an alarm. “We’re residents. We live here. We eat here. We want to work and play here and that is quite difficult,” said Kai Grant, who organized and hosted the meeting at Black Market, the pop-up retail business she runs with her husband on Washington Street. Over about four hours, the packed gathering discussed what they see as impediments to prosperity in Dudley Square and then broke into small groups to discuss possible solutions. There was palpable heartache over the fate of Haley House Bakery Café , which last month announced it was closing temporarily to revamp its restaurant operation due to unsustainable financial losses. The cafe remains closed, but plans to open Sunday afternoon for an annual fund-raiser known as Souper Bowl. The city has made Dudley Square a priority for economic revitalization, spending more than $120 million to renovate the former Ferdinand building and merge it with two nearby structures to create the Bruce C. Bolling Municipal Building, the headquarters for Boston Public Schools. The building opened in 2015. A jazz cafe is expected to open there soon and Mayor Martin J. Walsh last week went to Dudley Square to launch the city’s new mobile Economic Development Center. But so far the city’s efforts haven’t been enough, Grant said. City Councilor Kim Janey said business owners should have the chance to buy their space. Those gathered at the meeting described a range of problems that have prevented the neighborhood from reaching its potential. Litter, public urination, and the consumption of alcohol and drugs in plain view make it difficult for some people to navigate Dudley Square, while others don’t bothering visiting for those reasons. Cecelia Lizotte, owner of Suya Joint on Dudley Street, said the restaurant is allowed to stay open until 2 a.m., but many patrons aren’t willing to stay that late because they worry about safety. “We do have customers who travel from Randolph, Rhode Island, New Hampshire, Maine, and they do want to stay a little longer to just enjoy the neighborhood, but because of the security issue they are afraid to come over here,” she said. Systemic factors like racism, income equality, and affordable housing policy have played a significant role in shaping Dudley Square, said Dianne Wilkerson, a former state senator. About 75 percent of renters in the neighborhood live in subsidized units that they can only keep if they “promise on paper to stay poor,” she said. She implored the crowd to spend money on goods and services offered by people of color. “If you’re not intentional and conscious about wanting to do business with local businesses, wanting to do business with black and Latino businesses, then you’re fronting,” Wilkerson said. Fred Fairfield, a developer in Roxbury, said the neighborhood needs more market-rate housing, which would populate Dudley Square with customers who can afford to support local businesses. “We need to put in housing around here that can support our merchants,” he said. 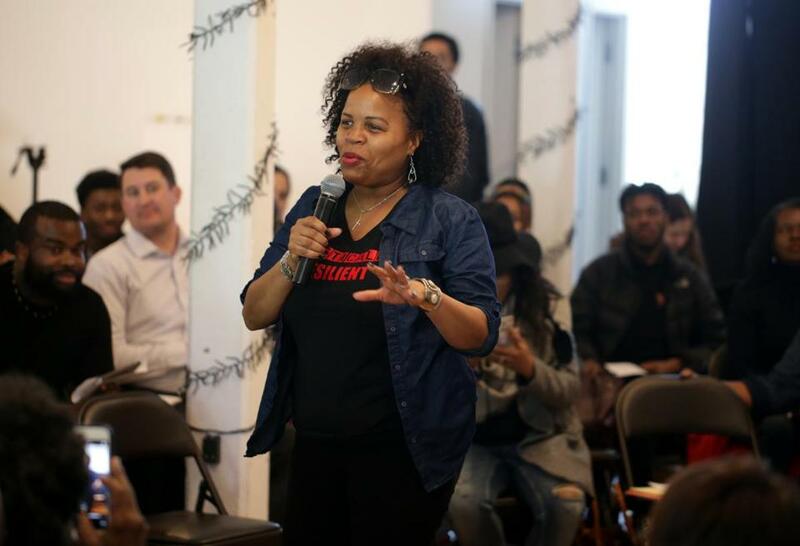 City Councilor Kim Janey, who represents Roxbury, said business owners should have the opportunity to purchase commercial space the same way condominiums are bought and sold. Richard Taylor, a former transportation secretary under governor William Weld, relayed ideas about pressuring landlords with vacant storefronts, developing social media channels to share good news from Dudley Square, and implementing a Downtown Crossing-style ambassador program. In Downtown Crossing, ambassadors pick up trash, remove graffiti, greet pedestrians, and perform other services. 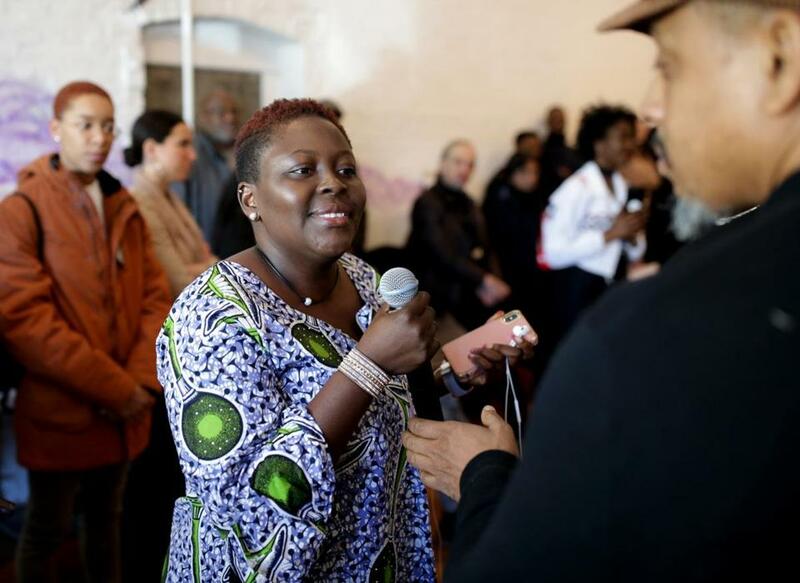 Destiny Polk, an artist and activist, told the gathering their wallets hold the antidote to many of Dudley Square’s woes. “How much can we invest in these businesses that we say we care about?” she asked.